It’s almost time for thousands to lace up their shoes, pin on their race numbers, and wait for the starting gun. 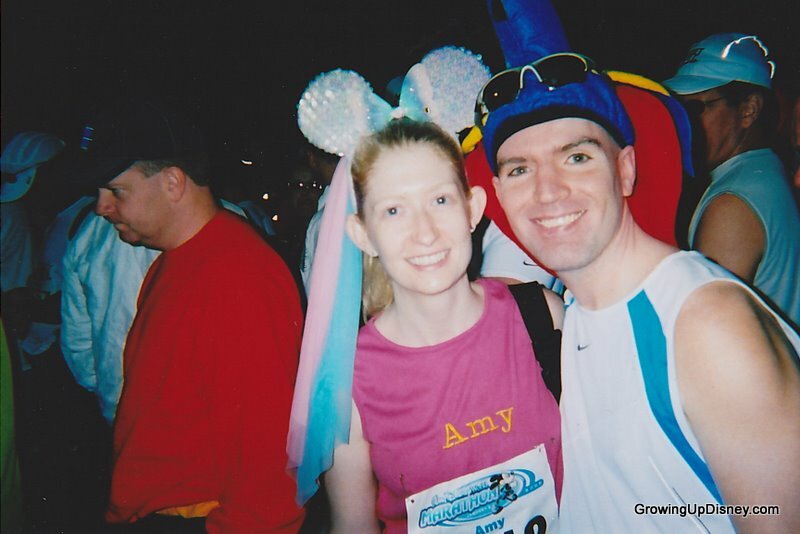 I participated in the 2005 Walt Disney World Marathon and it’s quite an experience. Best wishes to those who will toe the line in the half and full marathons this coming weekend! I ran my first 5k in October of 2003, followed by my first 10k in November 2003. It wasn’t long before I was training for my first half marathon in April 2004. My employer at the time had a wonderful policy of paying the entry fee for cheap races and half of the fee for more expensive ones. The only catch was there had to be at least two employees participating. This was how I met my running buddy, Andrew. 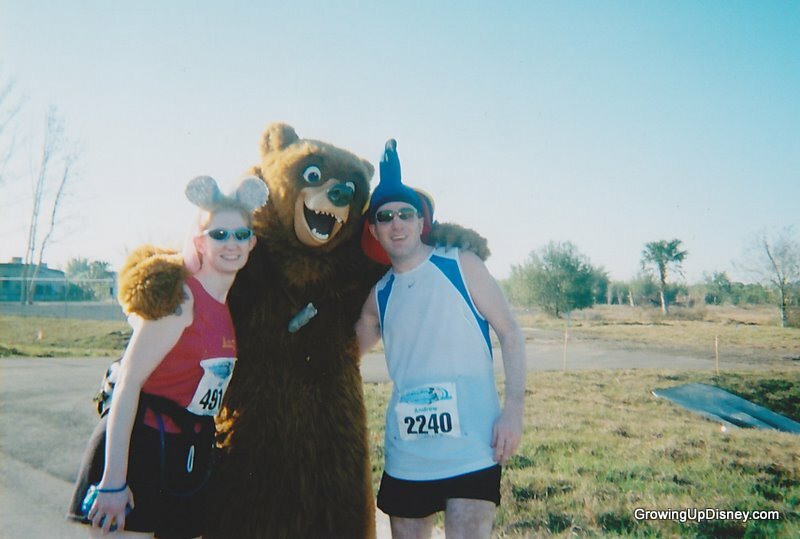 We were both interested in running the 2005 Walt Disney World Marathon. This was to be my first full marathon and his second. We trained for many months and he’s a tough trainer. I think we did several twenty milers in preparation for the big day. Finally marathon morning arrived. I had been to the expo the day before at the Wide World of Sports complex to pick up my race packet and was all set. 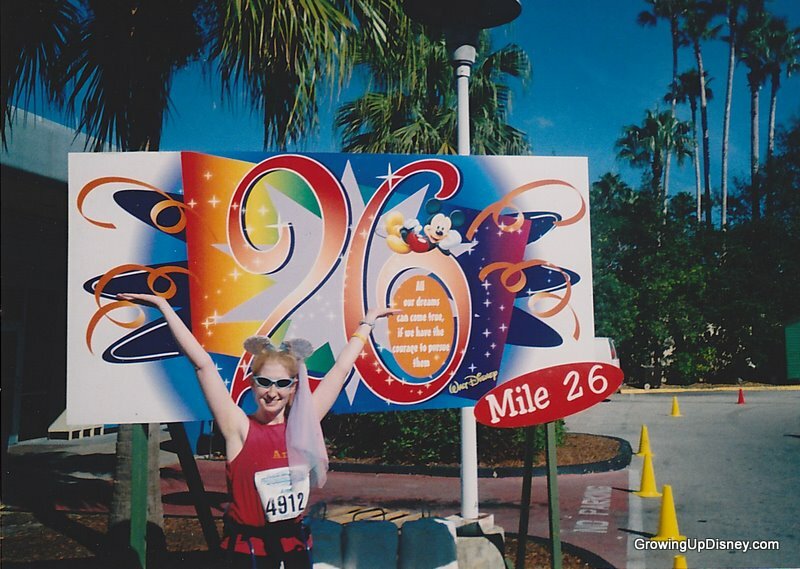 I had my race bib (number), all my favorite running clothes, well broken-in shoes, custom WDW marathon timing chip, Camelbak bag, and Minnie Mouse ears. I got up in the middle of the night, dressed, ate my usual peanut butter sandwich and a banana and headed out for the bus, which left at 3:30 AM. Thankfully Old Key West was one of the resorts offering transportation to the starting area in the Epcot parking lot. Unless it has to do with road closures, I’ve never understood why Disney wants you at the starting area so early for their races. I’ve done multiple 5k and 10k races there and they always ask you to be there far in advance. I was finally ready to head to my corral. When I ran in 2005, the marathon and half marathon were on the same day and each had a limit of 12,000 people. Both races started together and the half split off somewhere along the way. For crowd control and to give each runner the best chance at a good start, Disney uses a corral system. You are assigned a corral based on how fast you’ve run previous races. At least a 10 mile race was required for the full marathon and if you don’t provide a time, you start in the very back. I had run my little heart out in a 10 miler in December to earn my corral C start. Andrew and I both saw the marathon as a celebration of all our hard work and we’d each chosen fun headgear for the event. I had sequined Minnie ears with multicolored streamers. Andrew had a large parrot hat. Additional bonus…it was far easier to find each other in the corrals this way. I should have known we were in trouble since I wasn’t totally miserable standing on the road in the wee hours of the morning in shorts and a tank top in early January. 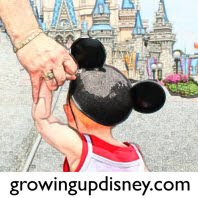 In my opinion, just like commando touring isn’t the best way to see the parks, a Disney marathon isn’t the best place to go for a new personal record. Even the marathon is an opportunity for Disney to entertain and inspire. DJs keep the pre-race time lively and provide some tunes along lonelier stretches of the course. The starting gun follows a brief show with Mickey, Minnie and fireworks. We carried cameras and stopped many times for character photos. Yes, this added at least a half hour to the time we could have run, but there is no way I was passing up a chance to hug Mickey! Some obscure characters are available for photos along the way and there was usually a Cast Member ready to take the pic so you could hand off your camera, quickly pose, and be back to running. The course is pretty limited to spectators, so Disney tries hard to provide entertainment. Since I tend to start toward the back of races, I’m always amazed by the sea of people. It’s truly moving to be a part of such a thing: so many people working toward a goal. Thousands of different motivations for being there, but all putting one foot in front of the other for miles seeking the finish line and a medal. The Walt Disney World Marathon course takes participants through all four theme parks. My family (DisneyDad, DisneyMom, Ridge, and then fiancé Andy) was able to meet up with us at various locations during the race, assisted by text messages generated when my timing chip passed specific points on the course. I’ve asked Chris to write his own article about the journey he and Andy took to cheer me on at several spots along the way. It was so encouraging to see them! I’ll leave out the boring stretches of road with no spectators and not too much to look at and focus on the highlights within the parks to keep this from getting too long. Disney does try to provide music, trivia questions, etc. in those areas, but there is only so much they can do. The first park we entered was Epcot. It was still dark and Spaceship Earth looked beautiful. After sunrise, we entered Magic Kingdom. DisneyDad was there on Main Street. Swags of Christmas greenery still hung from the buildings. In front of us was Cinderella Castle. Now, I’ve seen the castle more times than I could possibly count, but this was one of the best views ever. 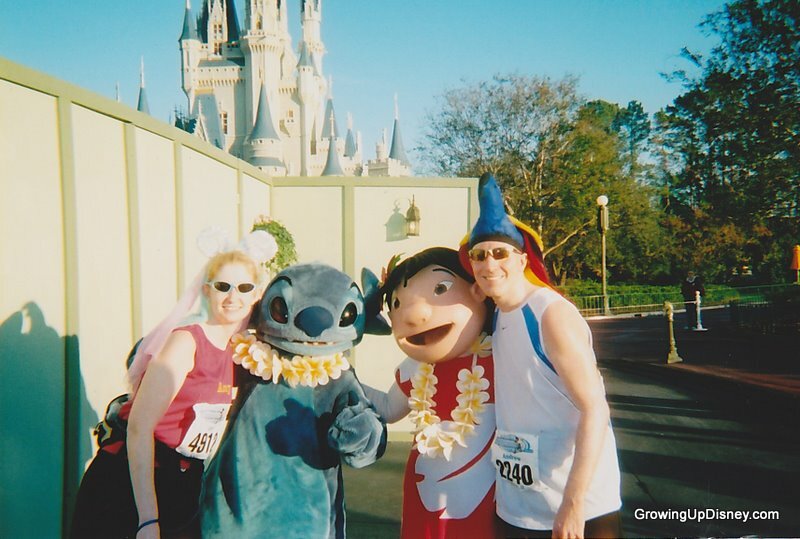 Andrew and I stopped at the end of the street for a quick pic with Lilo and Stitch. As the course carried us around the back of the castle, Suzy and Perla were dancing and waving from the restaurant balcony. It was still well before park opening, but the carousel was spinning and its delightful music filled the air. The races route you in and out of parks through backstage areas, and we got a glimpse of Cinderella’s coach as we left Magic Kingdom. Andy and Chris jogged with us briefly along the road outside of the Grand Floridian. Once we finally reached Animal Kingdom, it was getting brutally hot for a race day and our shade was pretty much gone. You just don’t know what you’ll get in Central Florida. I had spoken with a lady in my corral who had run the previous year’s race and said it was so cold she never did warm up. Animal Kingdom provided a few surprises. In addition to DJs, character greetings, and parade floats, there were also chances to stop and visit with some of the park’s animal inhabitants. The uneven walkways are perfectly themed but are a little tough on someone who’s already run 17ish miles. We did appreciate the shade in the center of the park and the wet sponges they passed out backstage to try to cool us all down. Andy and Chris were outside of DAK for another hello. If you’ve ever run a 10k at WDW starting at Wide World of Sports, going through Hollywood Studios, and ending in Epcot, you’ve essentially run the end of the marathon without that pesky 20 mile warm-up. Disney had a high school band performing at mile 20. I’ll admit I got a little misty. 20 miles is a big point because that’s as far as most people train, so anything beyond that is farther than you’ve pushed yourself before. Oh, and the heat was taking its toll. Hollywood Studios offered the opportunity to ham it up with Toy Story characters, Kermit and Piggy, and others. 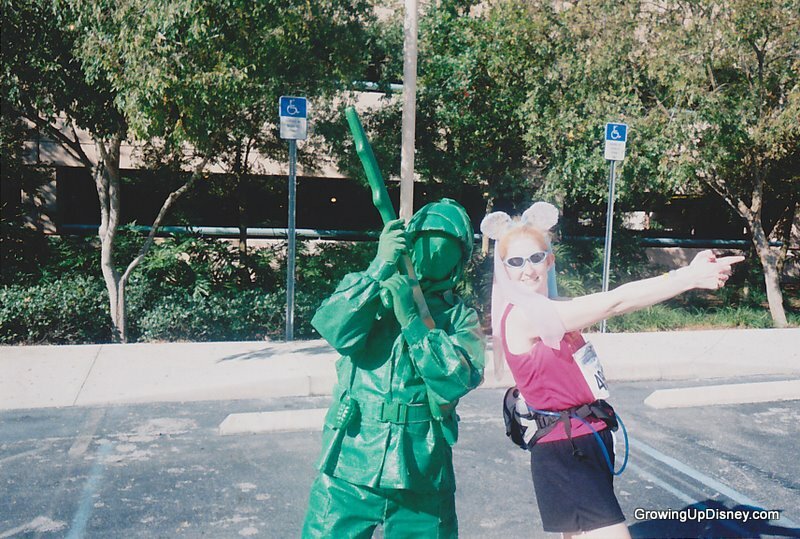 I had to take a Charlie’s Angels-style shot with one of the green army men. Once we hit the main drag, Pooh and pals were there to greet us. By this point, we were in an open park and did get some strange looks from the tourists. My mom was out front of the park waiting to cheer us on. Following the BoardWalk around, we entered World Showcase through the gate near the phones in the United Kingdom pavilion. As we exited into another backstage area, Disney had a gospel choir performing. With all that heat, I had already seen Jesus many miles back; seriously, no one else can help you at that point. After one more photo stop with the mile 26 marker, it was on to the finish line in the parking lot. I was thankful to be wearing my shades to hide the tears from the camera. Another TMI statement, Disney surrounds the finish line area with shrubbery and judging from the kitty litter that had already been scattered by the time we got there, I don’t think it’s all about decoration. I think one of the medical personnel thought I was going to add to it and grabbed me after I crossed the line. I don't do well with lots of heat and just needed a chance to cool down. I received my Mickey medal from a volunteer and headed straight for the PowerAde. 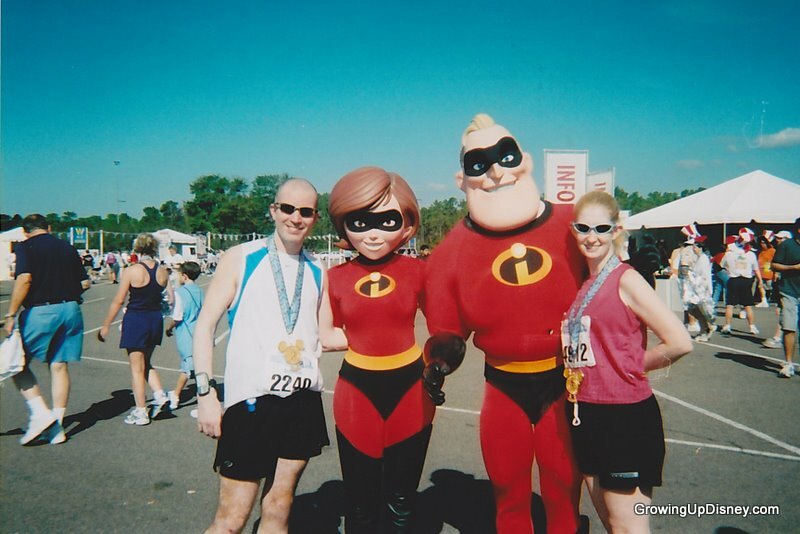 Andrew and I were able to get one more character photo; this time with the Incredibles. That evening, my family celebrated my victory with dinner at Cinderella’s Royal Table. This was before it was a character meal and probably the last time I will go until Tink insists on dining with Cindy. 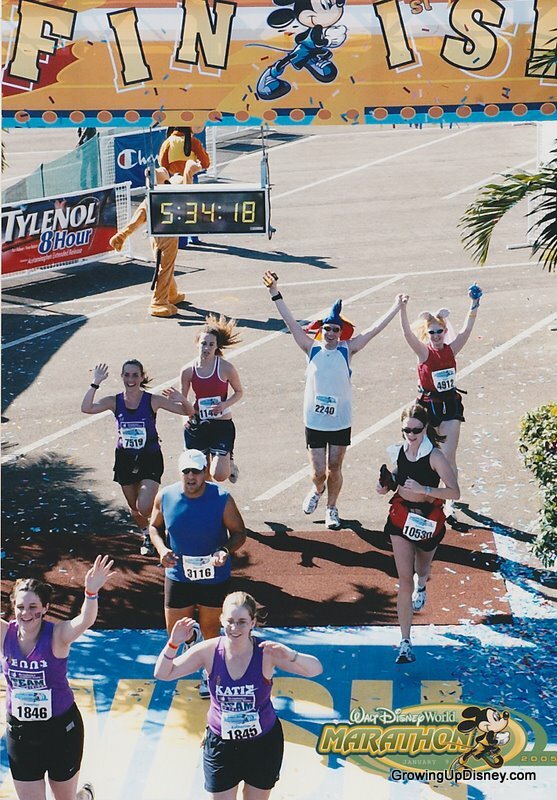 I’ve done one other full marathon, a couple of halfs, and lots of smaller races since then, but my first Walt Disney World Marathon was definitely a day I’ll never forget. Good luck again to everyone running in the 2011 Walt Disney World full and half marathons and the Goofy Challenge. You are all winners! Visit the Flickr feed in the right column for all of the photos from the big day. Most of them were taken on actual film and my scanner put some of them out of order, but you get the idea. oh amy that post brought tears to my eyes. congrats to you for doing such a big race! 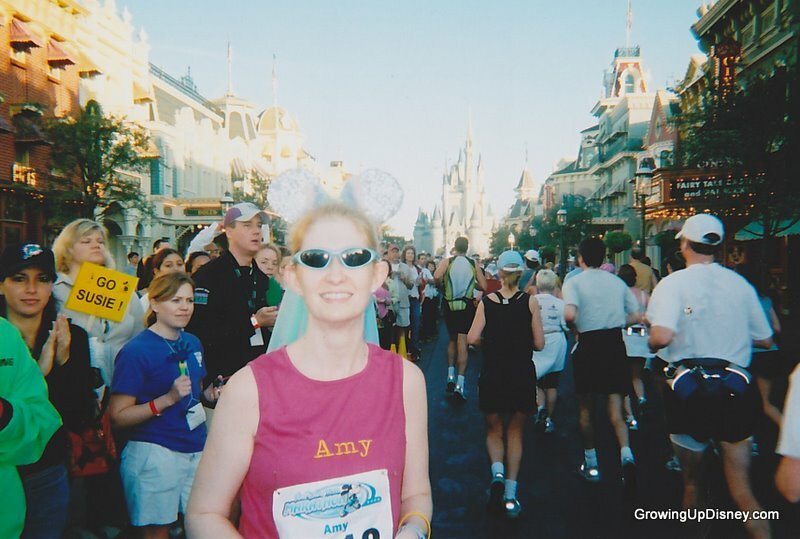 i'm still trying to train for the princess half and i have dreams of doing the wdw marathon next year. i will definitely be wearing sunglasses because if i cried just looking at your crossing the finish line photo, lord knows what i'll do when i actually finish!! your post is just what i needed for some extra motivation for my training. thanks!!! I got misty eyed too as I read this. What an incredible experience! 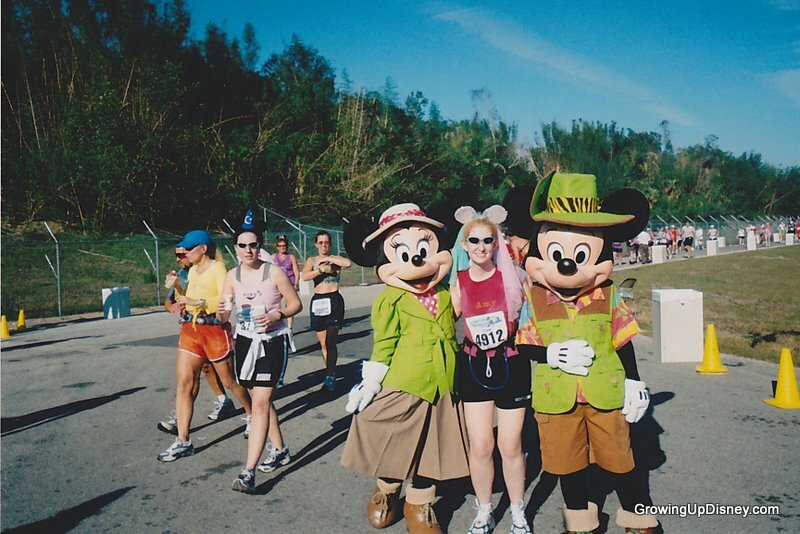 I hope to someday participate in a WDW Marathon. I know who I'll be going to for advice when the time comes! Great article and thanks for sharing your experience! Thank you Nancy! I know you'll have a great time in the Princess Half and I look forward to reading about it!!! I can't wait to do this one again, only this time with two little ones holding up a "Go Mommy!" sign. Thanks Beth! I'd be thrilled to give you some pointers. You can do it! what a great article! I too (an avid 'non-runner') got misty eyed reading about your journey! I esp. love the "I had already seen Jesus many miles back." Thanks for sharing!! You make me want to try the full.. someday! Or, maybe I'll stick with the 1/2s!